Recommended visiting is from 5am to 9pm. All major arterial pathways and facilities are accessible and lit within these hours. Administration is open Monday to Friday 9am to 5pm. The Botanic Gardens Café is open Wednesday to Friday 9am to 3pm and weekends 8am to 4pm, Closed public holidays. the main entrance on Lagoon Street outside the Gardens Administration and are open 6:00am to 8:00pm. 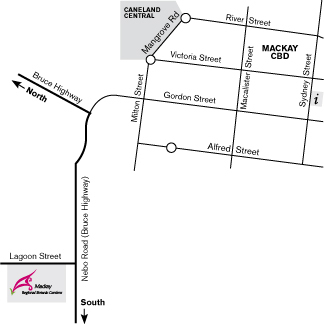 Mackay Tourist Information Centre, opposite the southern entrance at Ram Chandra Place. We welcome dogs and their owners to the Botanic Gardens. Dogs must be on a leash at all times and there are no ''off-lead'' areas. "Doggy-doo" bags are located at all main entrances to the Gardens and dogs owners are encouraged to use these free facilities. Please do not allow your dogs to swim in the Lagoons, as these are important habitat and breeding areas for local and migratory birds and other local wildlife. Please be aware that our plant species within the gardens are part of our living collection and collection or procurement of any plant material, living or dead is not permitted without the express permission of the Gardens Coordinator. Please slow down when bike riding through the Botanic Gardens pathways. Our pathways are shared by a range of users including walkers, maintenance vehicles, scooters and parents/ carers with prams, wheelchairs. Please walk bicycles in areas where you see ‘no bicycle’ symbols along the pathways. Please contact Gardens Administration if you wish to hold a wedding or event in the Gardens (phone 4952 7300 or email botanic@mackay.qld.gov.au). The Gardens provide habitat for a range of wildlife. We encourage visitors to take photos only, however please do not interfere with any wildlife during your visit in the Gardens. Please park in designated carparking spaces only. Camping is not permitted in the Gardens. Horse riding and riding of any unauthorised vehicles through the Gardens is not permitted. For more information contact the gardens.